Artists have been using screen printing techniques since early in recorded history; The first recorded mention of screen printing dates back as early as 960 AD during the Song Dynasty in China. From there, the technology was adopted by Japan and later Europe. Since its origins, the medium has expanded into various industries and applications, and remains relevant today as an innovative and versatile art form. An early printing studio in China. The screen printing process is a type of stenciling, wherein the negative space of an image is glued over a tightly-pulled mesh to obstruct ink passing through the screen. Once the ink is pressed on the screen with a squeegee, only the clear areas allow ink to imprint onto the surface. Screen printing has fewer limitations than other forms of printing: it requires only manual pressure and it can be printed on almost any surface with a multitude of inks. The screen printed works differ slightly from registration to registration, offering a touch of human imperfection to each piece. 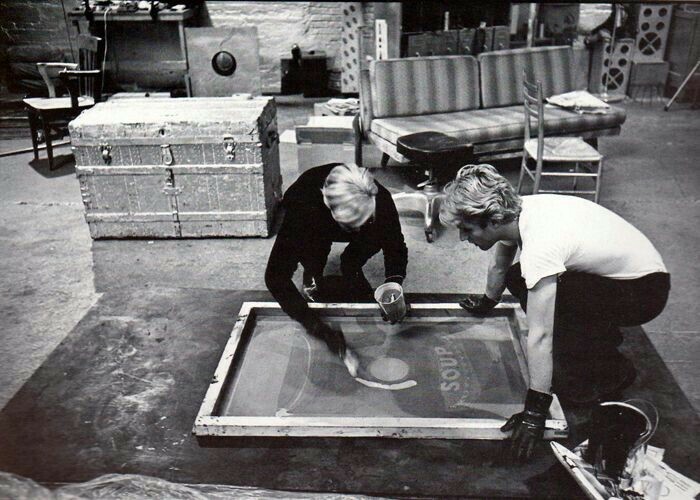 Andy Warhol and assistant Gérard Malanga blocking a silk screen with glue, 1960. 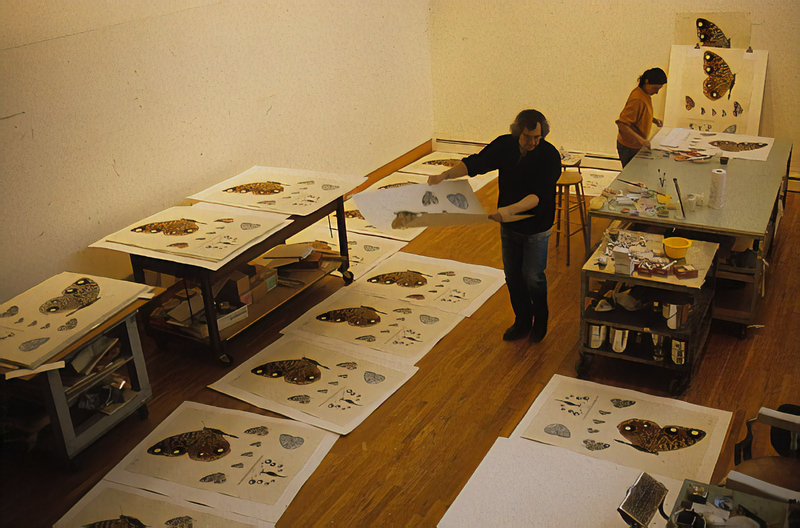 Donald Sultan surrounded by prints in his studio. Donald Sultan often applies flocking, which he refers to as “artificial velvet”, to give works a textured finish. This step in the process adds a human, organic dimension to the industrially-inclined pieces. Donald Sultan applies black flocking to a wood panel. 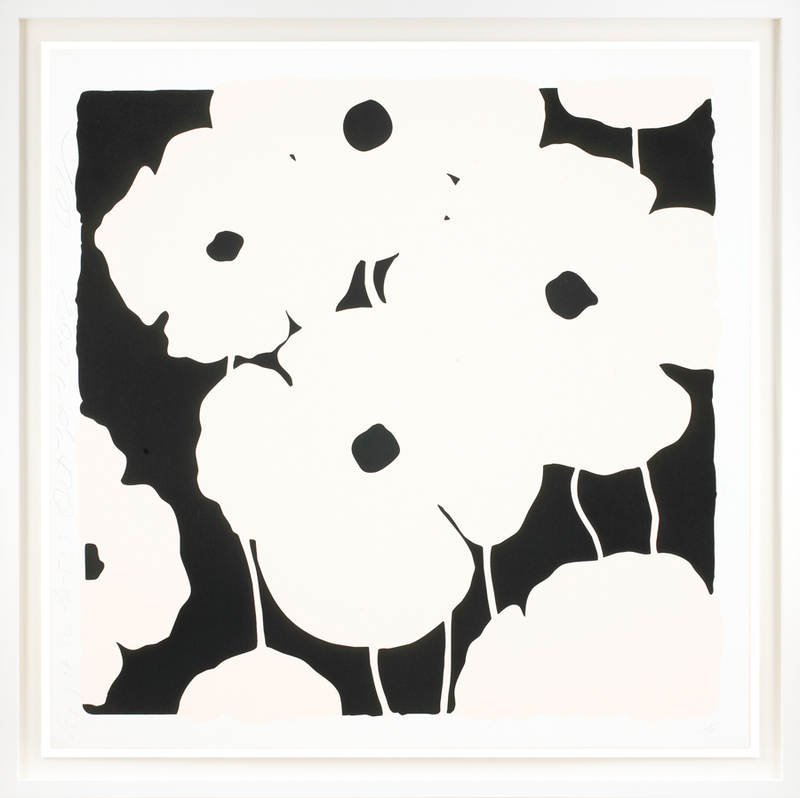 Donald Sultan, “Eight Whites”, Color Screenprint with Flocking, 58 × 58 inches. For inquiries on our collection of screen prints, please contact the gallery nearest to you. Revolver Gallery, “Andy Warhol Screenprints—The Process and History” http://revolverwarholgallery.com/andy-warhol-screenprints-process-history/. Reserve Channel, “Donald Sultan | Art in Progress | Reserve Channel”. Video. https://www.youtube.com/watch?v=whDMSUBiKSQ. 29 minutes 37 seconds.